It's still supremely portable, and powerful enough for almost everyone. 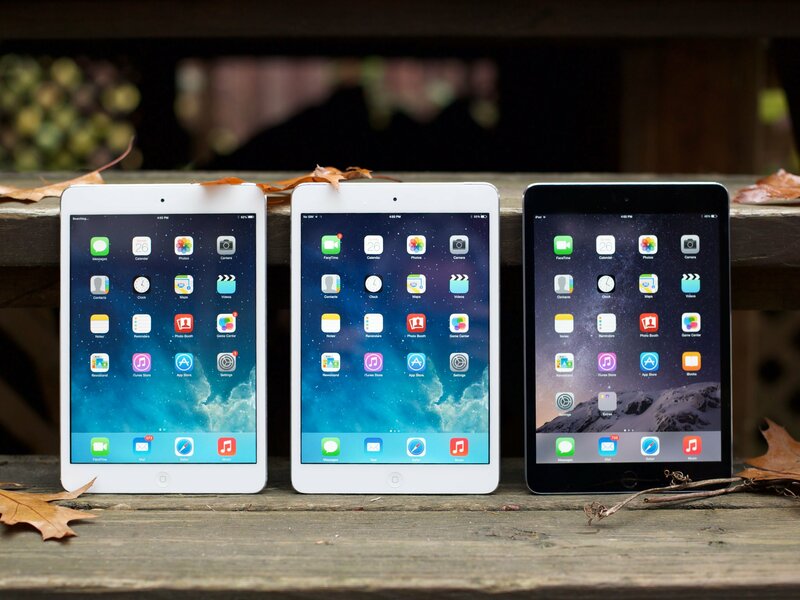 But two years after launch, and one year after Retina, is the iPad mini 3 enough? 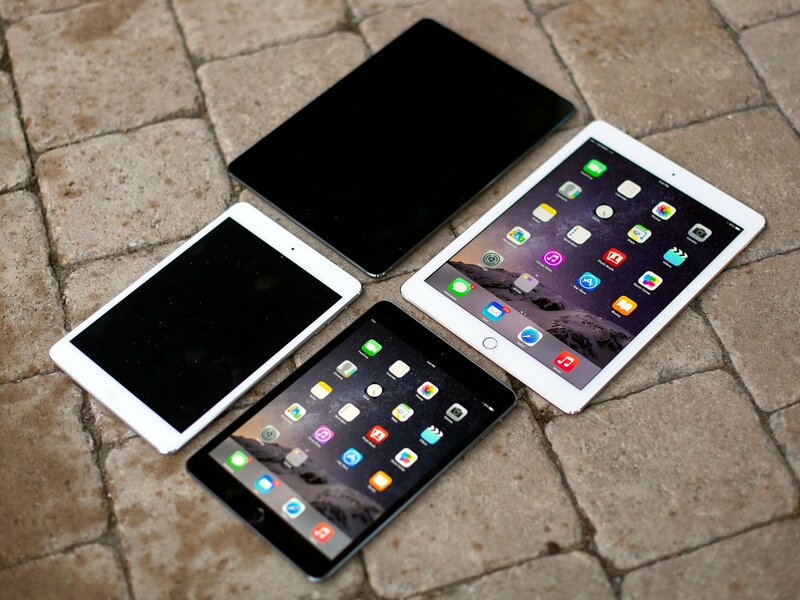 The iPad mini didn't get the same update as its bigger brother, iPad Air this year. There's no laminated display with antiglare coating, and there's no monstrous Apple A8X chipset. Internally, that which the iPad mini 2 had, the iPad mini 3 mirrors. So what do you get with Apple's newest version of its smallest iPad? A 7.9-inch high-resolution window into the internet and apps, made even more convenient thanks to the addition of Touch ID and Apple Pay, a slightly-more-fashionable model thanks to an optional gold finish, and more affordable pricing thanks to a reduction in price for the 64GB and 128GB models. 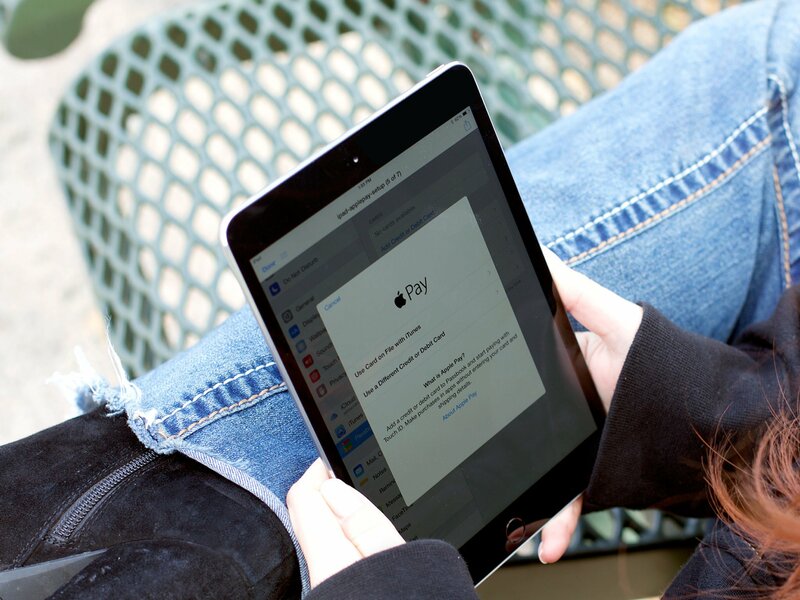 Touch ID and Apple Pay are potentially transformative additions to the iPad line, especially to the iPad mini. Lower prices for higher storage capacities are also great. Lack of the same display, chipset, and camera as the iPad Air 2 makes it less well suited for photographers, designers, and gamers. Touch ID and Apple Pay make the iPad mini 3 an even better tablet for anyone who values portability over power, and if you want 64GB or 128GB, those options are now more affordable than ever. Neither the iPad Air 2 or the iPad mini 3 got the same, austere, embossed packaging that encased Apple's new iPhone models this year; that said, with the iPad's product image now angled sideways, and given how thin the iPad mini 3 remains, it's not much of an on-box visual. "iPad mini" remains printed on the side, lacking an official version number. Included in the box are a power adapter, Apple Lightning to USB cable, a SIM removal tool (for cellular models), and Apple's typical information booklets to help new users get started with their device. 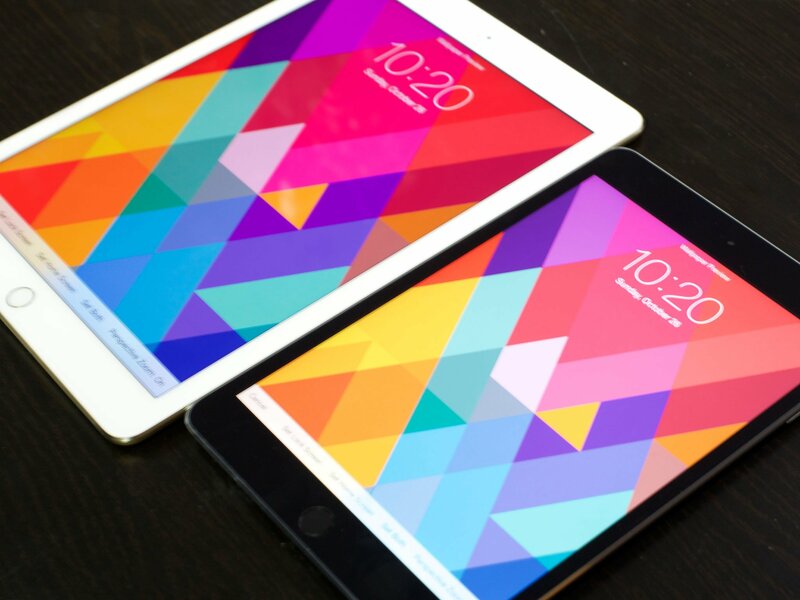 The iPad mini 3 looks almost identical to the iPad mini 2, which looked almost identical to the original iPad mini. The main differences this year come in the form of the Touch ID sensor — which replaces the old, dumb Home button with a smart one that can identify who we are — and an optional gold finish. That means the iPad mini 3 is the same 7.87 inches (200 mm) tall, 5.3 inches (134.7 mm) wide, and 0.29 inches (7.5 mm) deep as its predecessor, and weighs the same 0.73 pounds (331 g) — 0.75 pounds (341 g) for the cellular version — as the iPad mini 2. Continuing the theme, it sports the same 3.5mm headset jack and dual microphones at the top of the device, and the same top-mounted sleep/wake button — something that seems less natural now that the iPhone 6 and iPhone 6 Plus have moved it to the side. 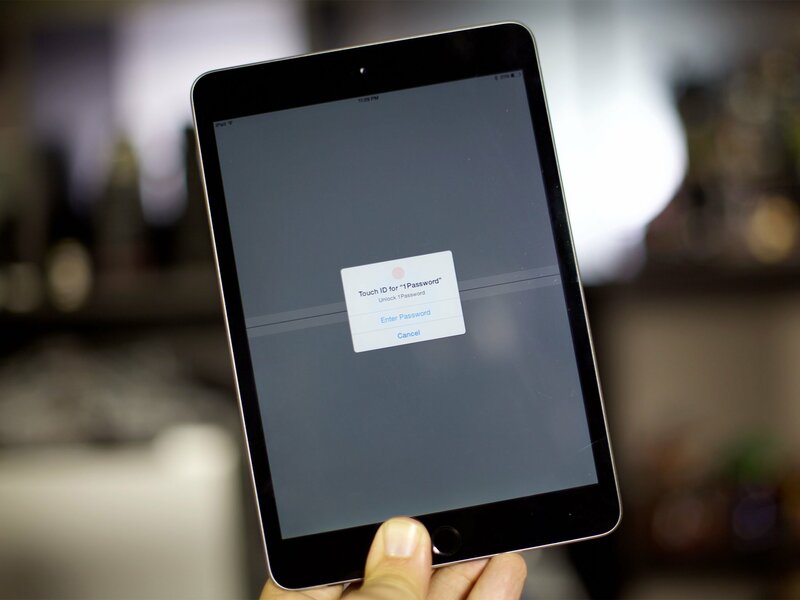 Unlike the iPad Air 2, the iPad mini 3 retains the mute/lock rotation switch on the side; immediately below that are the volume up and down buttons. On the bottom, you'll find the same dual, stereo speakers, and the same Lightning port. If it wasn't for Touch ID, this year's model would be impossible to tell apart from last year's... unless you go for gold. The iPad mini 3 also has the same 2048-by-1536-pixel, 326 ppi, 3:4-ratio Retina display as the iPad mini 2. The idea of packing that many pixels into so small an iPad seemed like a miracle last year: Sure, the panel had a lower color gamut than the iPad Air's, but... Retina. Unfortunately, this year the iPad mini 3 not only retains that lower color gamut, but also lacks the lamination or antiglare coating upgrades found in the iPad Air 2. Whereas before the mini was just half a step behind in its screen, it now feels several steps behind. For most people, however, it won't matter. The lower saturation in the reds and purples won't be that noticeable to untrained eyes, and while light reflections when viewing from an angle are a pain, they can be worked around—same as they have been over the past few years. If it wasn't for the Touch ID taking the place of the Home button (see below), this year's model would be impossible to tell apart from last year's... unless you go for gold. Color may not seem like a major differentiator, but it's a highly visible one. And last year's iPhone 5s proved that many people get just as excited, if not more, about a new finish than they do new features. The mini's new color option looks identical to the newer, deeper golden color of the iPhone 6 and iPhone 6 Plus, first introduced last month. 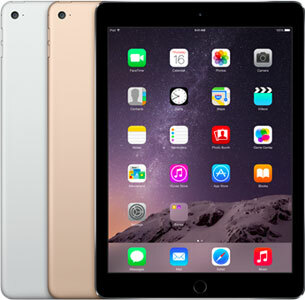 If you already have a gold iPhone and want to match it, or if you simply want to make sure everyone knows you have the latest and greatest iPad mini, then the gold iPad mini 3 is your answer. 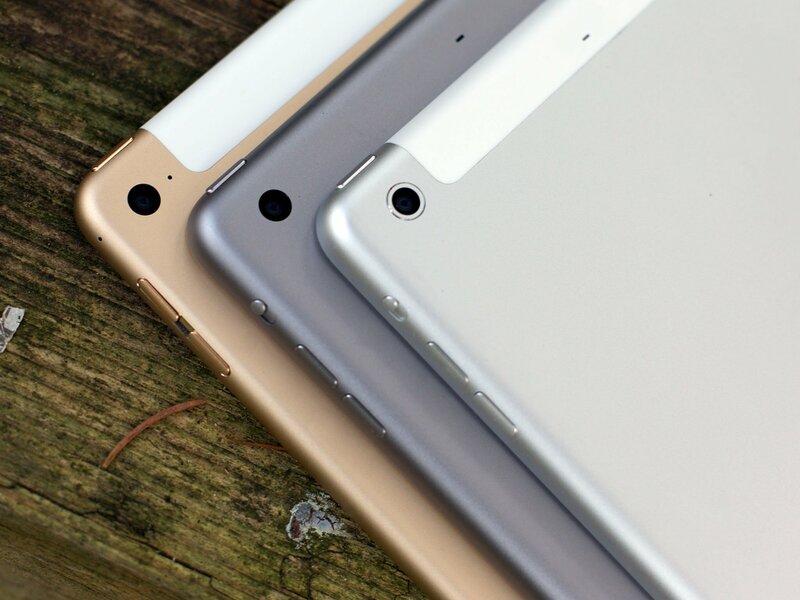 The similarities between the iPad mini 3 and iPad mini 2 aren't just skin deep: They go straight down to the chipsets. Unlike the iPad Air 2, which boasts the new triple-core Apple A8X system-on-a-chip, the iPad mini 3 is sticking with last year's Apple A7. It's possible Apple's supplier hit production limits on the new 20-nanometer process simply trying to fulfill orders for the new phone and full-sized tablet models; just like last year, when there reportedly weren't enough Touch ID chips to go around, this year A8 chipsets may be the restrained hardware. Whatever the reason, the CPU remains the same, the GPU remains the same, and the camera, LTE, and Wi-Fi remain the same — 5-megapixel back camera, 100mbps (not-Advanced) LTE, and 802.11n (not ac) Wi-Fi. 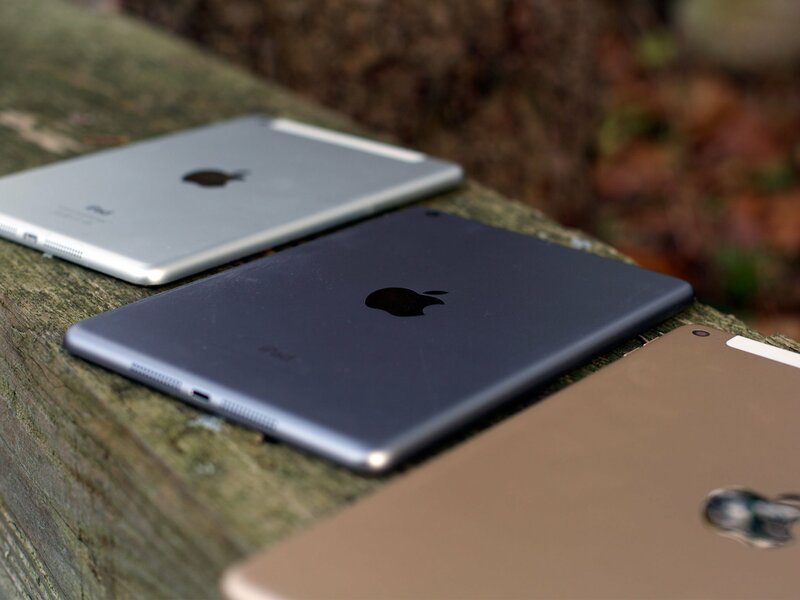 In many ways, this is similar to 2012: When the iPad mini launched, it used the older Apple A5 platform while the iPad 4 upgraded to the Apple A6. In all honesty, it makes 2013 — when the iPad mini 2 and original iPad Air both landed on the Apple A7 — seem like the anomaly. However, three versions in three years simply isn't enough device releases or time to draw any patterns. Most people won't push the limits of the Apple A7, 5 megapixels, 100mpbs LTE, or 802.11n Wi-Fi. 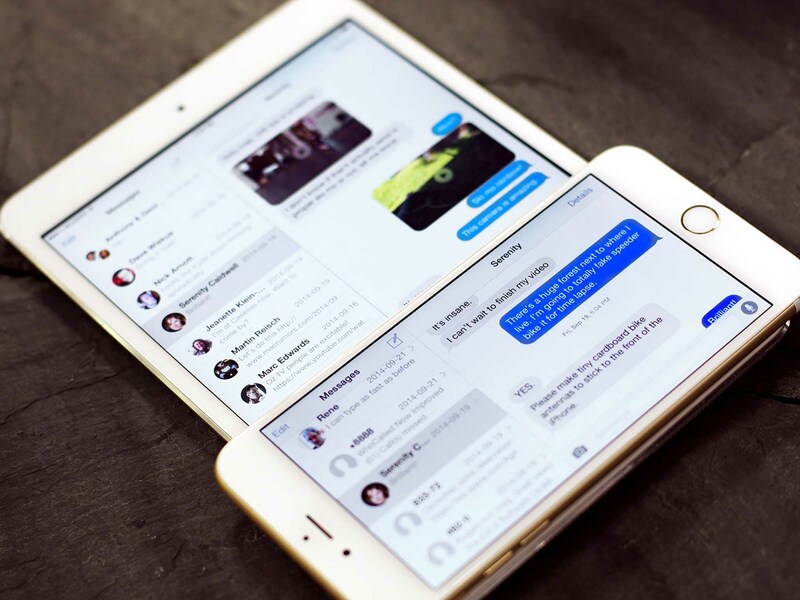 And if you think you might, as with our advice regarding displays, there's an iPad Air — or iPhone 6 Plus — for you. 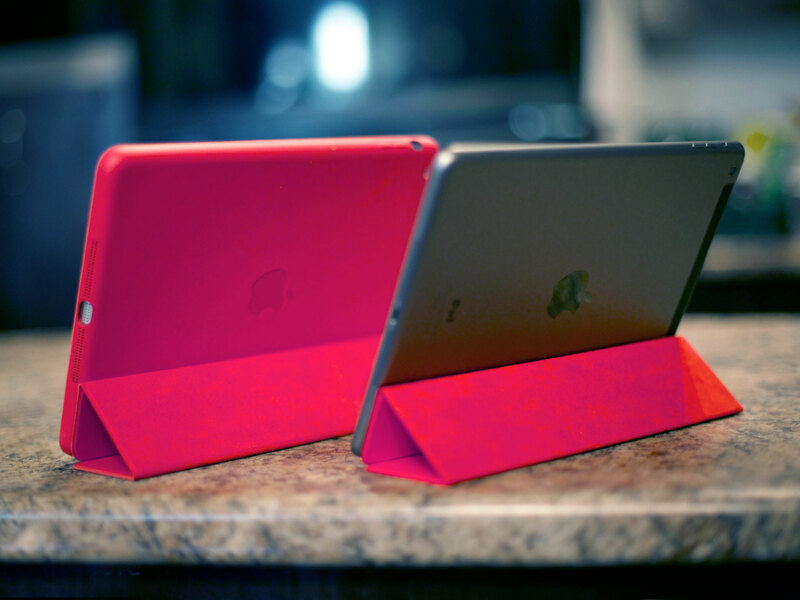 In an ideal world, we'd love for the iPad mini 3 to match the iPad Air 2's leap forward in power. In reality, it's catching up on the iPhone's biometric convenience. Touch ID is Apple's biometric fingerprint identity sensor. It debuted with the iPhone 5s last year, replacing the traditional Home button. And now it's come to the iPad mini 3. To make Touch ID secure, Apple implements a sophisticated — and rather interesting — system. When the capacitive ring around the sensor detects the presence of a finger, a high-resolution lens reads it. Once that fingerprint is read, it's converted to a mathematical hash and the original image is destroyed. That hash is then sent to the iPad mini's secure enclave, found within the Apple A7 chipset, and compared to any of the fingerprints registered there. If a match is found, the secure enclave releases a "yes" token. If no match is found, it releases a "no" token. Touch ID is so good that once you start using it, you want it everywhere. Never mind just your iPhone or iPad: You want it on your car and on your house. And you'll want it for Apple Pay. And you'll want it for Apple Pay. If you you want to shop from the comfort of your sofa or desk, however, the iPad mini 3 should more than meet your needs — assuming the merchant in question offers a compatible app from the App Store. Launch the app, browse until you find something you want, and the tap "Buy with Apple Pay". You'll get a summary of your bill and, once you authorize the purchase with Touch ID, you're done. No fumbling for your wallet. No need to memorize numbers. No password manager to invoke. Like in-app purchases and Amazon's 1-Click, it makes the decision to buy easy and the process… fun. Maybe even too easy and fun? Happily, it also makes it safe. If you've already set up an iPhone 6 or iPhone 6 Plus for Apple Pay, you'll have to setup your iPad mini 3 separately. Apple stores all your credit card information locally in the Secure Element, and doesn't uploads it to their servers so it can't be synced across devices. This is one area where security trumps convenience. When you use Apple Pay, the Secure Element doesn't give the merchant your actual credit card number, but a one-time number. This protects your actual information from being compromised if, for whatever reason, the merchant you purchase from is breached or otherwise exposed. All that said, Apple Pay is still limited at present. Developers are just beginning to integrate it into their apps. You can buy from Target or Staples; pick up a ride from Uber or Lyft; get a sandwich to pick up at Panera or a dinner reservation at OpenTable; and more. It's incredibly convenient when it's there, but it will likely be a while before Apple Pay is everywhere. 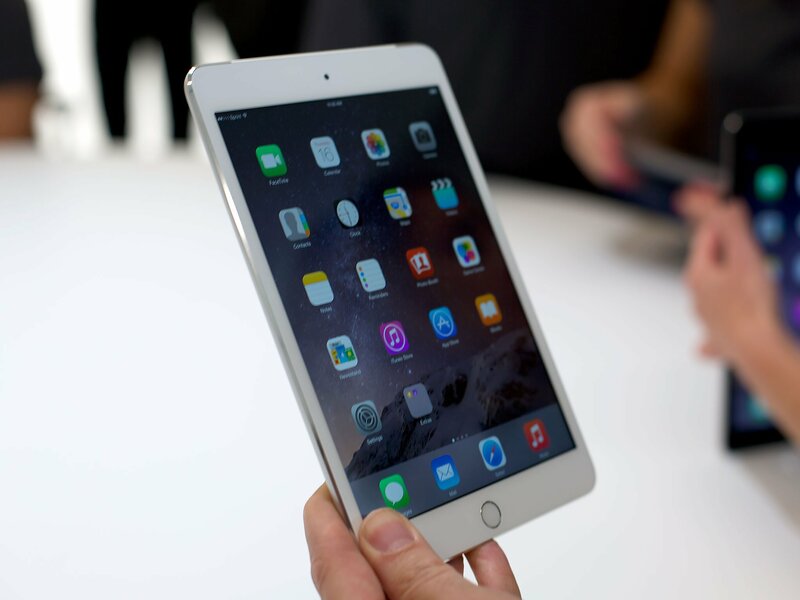 The iPad mini 3 ships with iOS 8.1, the first point-release update to Apple's 2014 mobile operating system. It includes updates to Messages and Photos, a predictive keyboard and contextual Spotlight, improved Mail and Safari, Family Sharing options and Continuity workflows, and Extensibility, which allows for interactive notifications, custom keyboards, custom sharing and action options, custom photo filters and effects, widgets, iCloud Drive, and custom storage providers. There are also new frameworks like HomeKit for home automation, manual camera controls, Touch ID authentication for third-party apps, SpriteKit, SceneKit, and Metal for games, and a new programming language called Swift. Built-in apps include FaceTime, Calendar, Photos, Camera, Contacts, Clock, Maps, Videos, Notes, Reminders, Photo Booth, Game Center, Newsstand, iTunes Store, App Store, as well as the new Tips program; iBooks and Podcasts also move from downloadable App Store apps to default status. On 64GB and 128GB iPad models, Apple is also pre-installing the iWork and iLife apps — Pages, Keynote, Numbers, GarageBand, and iMovie, as well as iTunes U. You can additionally get a multitude of apps from Google, Microsoft, Facebook, Twitter, BlackBerry, and pretty much anyone and everyone else you could imagine through the App Store. Every iPad mini 3 comes with iCloud, which lets you back up and restore your data to and from Apple's servers. iCloud also lets you re-download anything you've bought on iTunes, the App Store, or the iBooks Store, including music, movies, TV shows, apps, games, and iBooks. Apple Stores, especially when combined with iCloud, whether extended by AppleCare+ or not, provide remarkable customer support for iPad mini owners. Apple specialists can help you test a device to make sure it's what you want, help you set it up, teach you how to use it, and if anything goes wrong, help you fix it. It's a feature not always included on competitive checklists but anyone who's ever needed to avail themselves of it knows just how important a feature it is. Since the iPad mini 3 uses the same casing as the iPad mini 2, and has the same Lightning adapter, it's essentially compatible with all the same accessories. That means there's already hundreds of great cases, chargers, and other peripherals already on the market for the iPad mini 3. The only exception is Touch ID. Where some cases could previously cover the Home button completely as long as they still allowed you to depress it, now they have to make sure the lens can still take an accurate image of your fingerprint as well. For a lot of cases, this may not be a problem. For a few, however, it might require a redesign. Check carefully before buying. 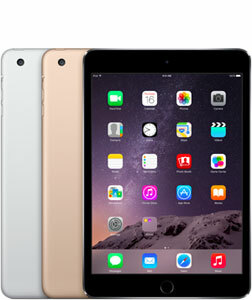 The iPad mini 3 comes in three capacities, 16GB, 64GB, and 128GB, and in both Wi-Fi and Wi-Fi + Cellular models. The Wi-Fi models cost $399, $499, and $599 respectively. The Wi-Fi + Cellular models cost $529, $629, and $729 respectively. 16GB will almost certainly prove too little for all but the lightest-use cases (such as education or enterprise, which buy in volume and install few apps or utilize web apps). 64GB and 128GB pricing is now $100 less than it was last year, however, making the larger-capacity options cheaper than ever, and absolutely something worth considering. The iPad mini 3 is nothing more than an iPad mini 2 with Touch ID and Apple Pay, a gold option, and cheaper 64GB and 128GB models. Whether you're looking to buy your first iPad or upgrading from a previous model, the iPad mini 3's enticement factor will depend entirely on how much you value Touch ID or want gold or more storage, all in that 7.9-inch form factor. In that way, the iPad mini 3 is similar to the original iPad mini in 2012 — where many found its portability more important than its lack of Retina display. 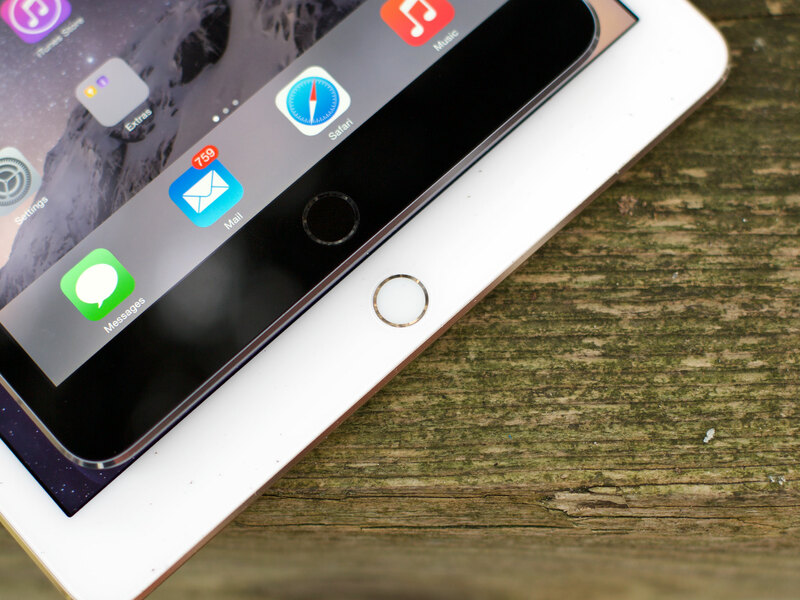 Some might argue that, at $100 less, the iPad mini 2 is a better value. They're wrong. It's a better deal, but the value will depend on the person. Apple cut the iPad mini 2 price so significantly because they want to make the iPad even more accessible to the general population. They could easily have cut it by only $50 instead and made the upsell to Touch ID seem much, much easier. 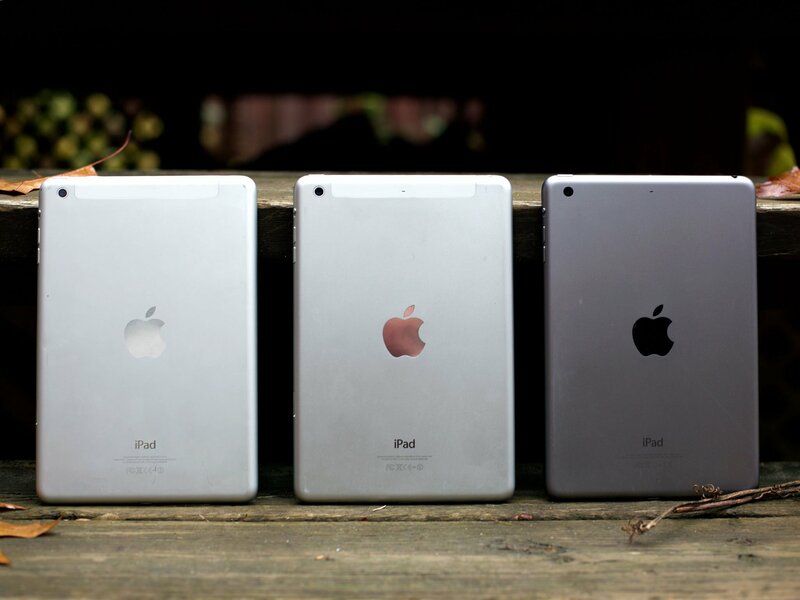 The psychology behind a lower cost of entry versus a lower cost of upgrade notwithstanding, if you don't have the extra $100, the iPad mini 2 will certainly serve you well, as would the 32GB model iPad mini 2 for the same price as the 16GB iPad mini 3. Because it didn't get the better display and newer chipset, and because it remains so similar in so many ways, the iPad mini 3 comes down more to a want than a need. That said, $100 really isn't that much when you consider you'll own the iPad mini 3 for a year, perhaps 2 or 3. Depending on how long you keep it, the difference in price could be less than the cost of a fancy coffee every month. If you already have Touch ID on your phone, then you already know the convenience its authentication and authorization brings. It can be almost maddening not to have it. How many of us have lost how many seconds just staring at an older iPad wondering why it won't open the moment our finger comes into contact with the Home button? If you don't already have Touch ID on your phone, you'll have to think about it. Unlocking your phone, opening your password manager and banking apps, and approving your iTunes and Apple Pay purchases, all with just the touch of your fingerprint — it can be a tempting upgrade. Likewise, if you've been waiting for the gold finish, or if you've wanted more storage, the iPad mini 3 might be the device for you. Because it didn't get the better display, because it didn't get the newer chipset, and because it remains so similar in so many ways, the iPad mini 3 comes down more to a want than a need — If you want gold, if you want 64GB or 128GB, if you want Touch ID and Apple Pay, all in a ludicrously portable 7.9-inch Retina package, then you want the iPad mini 3. Georgia Dow, Anthony Casella, and Derek Kessler contributed to this review.